Exercise in all forms can be beneficial to your health and longevity, particularly when you are consistent with it. However, here at Inspire Seattle, we focus on low-impact exercise with our Megaformer workouts. 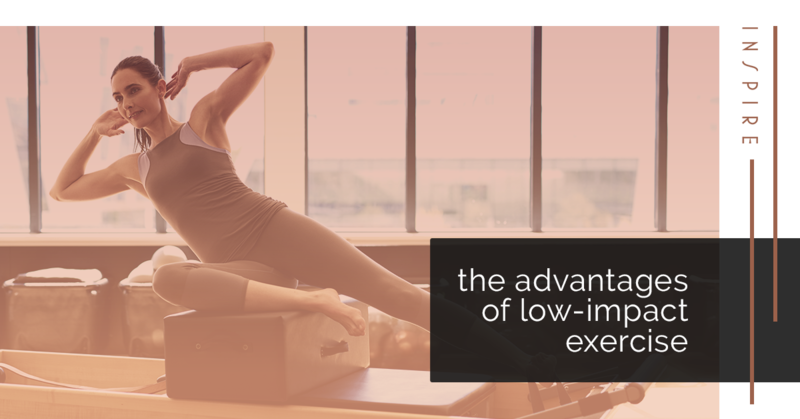 Low-impact exercise has several advantages over its counterpart, high-impact exercise, that you may not have known before. What is the Difference Between Low-Impact Exercise and High-Impact Exercise? There are two categories of types of exercise: high-impact and low-impact. High-impact exercise may sound intense; you might think of contact sports like football when you hear the term. However, high-impact is not necessarily coming into contact with another person. It can also refer to the internal impact on the joints. For example, running is a form of high-impact exercise. This cardio activity may be great for your heart, but over time, it erodes the joints and supporting muscles. In contrast, low-impact exercise does not involve any type of contact that stresses the joints, such as the impact of hitting the ground when you run. That doesn’t mean that low-impact exercise is easy, though. In fact, some low-impact exercises elevate heart rate more than high-impact exercises. For example, swimming is a great way to get the cardiovascular benefits you experience when running without the negative effects on the joints and muscles. Your chosen form of exercise has a big impact on the health of your joints over time. While people in their early 20s may have no problem running every day, over time, they are likely to face joint problems earlier than their peers who chose not to run. The cartilage that protects your joints wears with age, and the more impact they experience, the more quickly this happens. While this doesn’t mean you should resign yourself to never run again if you love it, it’s best to make sure you’re not overdoing it by incorporating low-impact exercise into your routine. You don’t need your exercise to be high-intensity in order to see cardiovascular benefits. High-intensity, low-impact exercise is just as, if not more, beneficial to your heart health, and studies show that doing low-impact exercises several times a week can lower the risk of heart disease by stimulating circulation and helping regulate blood pressure. Low-impact exercises provide the mental health benefits inherent to physical activity in a communal setting. For example, our Lagree Fitness workouts are taught in a classroom, so you can also reap the mental benefits of a supportive community. Because you have more control over your movements during low-impact exercise, you are in a better position to use your muscles strategically. While high-impact exercises like running rely on momentum, low-impact exercises allow you to use slow, controlled movements to gain better stability through your core. At Inspire Seattle, our Megaformer workouts are incredibly intense. By focusing on the slow-twitch muscle fibers, the Lagree Fitness workout builds your muscle strength and helps you achieve that lean, sculpted look, without a negative impact on your joints. If you’re interested in trying one of our classes, check out our schedule!